Apple TartMy friend Anneli gave me four beautiful ripe apples last week in return for a week’s guinea-pig-sitting whilst she went on a family camping trip. Now this wasn’t just any old pet, Coco, the guinea pig is very sweet but odd. She sits on her blanket all day eating – hay for breakfast, grains for lunch and fruits and vegetables for dinner. She doesn’t move. Not normal for a rodent surely? I was terrified she would die on my watch, all that food and no exercise. But we all survived and I got apples. And these weren’t just any apples either; the camping trip was in Sonoma County the home of the Gravenstein apple orchards. I couldn’t believe my luck. Four Gravensteins. When I got home I gave everyone strict instructions not to eat the apples as a snack. Me telling the children not to eat a piece of fruit?! And then the pressure began – what to do with them? The Gravenstein apple is an heirloom variety originally from Italy by way of Denmark and introduced to the US in the early nineteenth century. Once the first commercial apple harvested in the US, those days have long disappeared and this variety is in danger of going the same way. Despite it’s fine flavor, a tart sweetness, and intense aroma it doesn’t store well and further more it will drop at the drop of a hat – not what today’s farmers or supermarkets are looking for. Orchards have made way for vineyards and urban development in Sonoma and now very few remain. In 2005 the Gravenstein was honored and protected by Slow Food and included in their Ark of Taste. To get a bona fide Gravenstein you have to go to Sebastopol. Lucky for me Anneli did. This year it has been a particularly good summer for the Gravenstein, because it was foggy. How do I know so much about this apple – grown and dried or made into apple sauce to feed the troops of World War II? Pomologist David Karp appeared on Good Food on Saturday August 28th to talk to Evan Kleiman about the Gravenstein apple. Just hearing David wax lyrical about this “the most aromatic of all apples… Perfect for eating fresh, for its juice and for pies,” Pies? Did you mention pie to Evan? Of course you did! Evan’s second Annual Good Food Pie Contest happened last Sunday – let’s just say that there was far too much going on both at home with a Harajuku birthday party and around town (Taste of Beverly Hills and LA Times Celebration of Food and Wine) to cover everything culinary this weekend but I did want to honor the apples and what better way to do it than to make a pie. 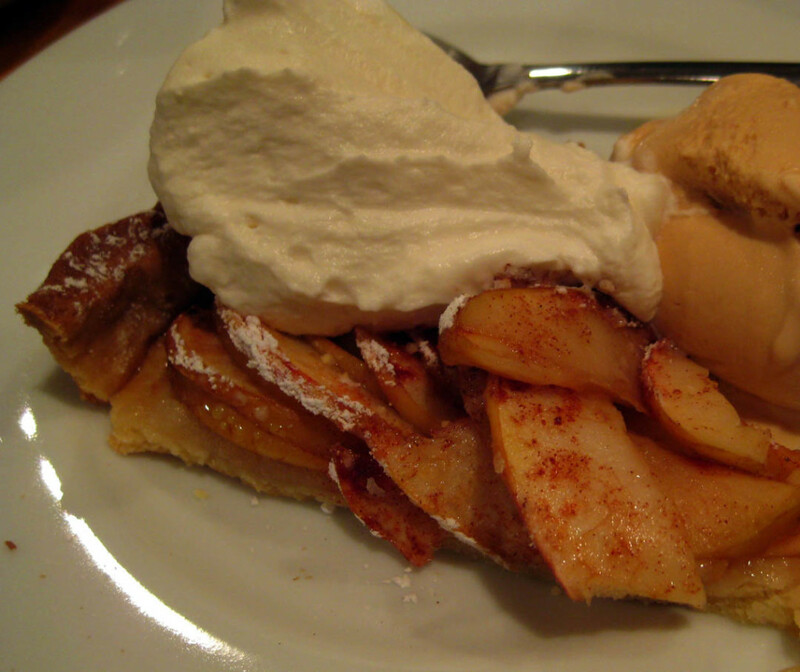 Also, when speaking to my friend ArtCook – who makes the best pies and who was entering – she bemoaned the fact that all the delicious ingredients going into her pie would be given up for the contest. I’m sorry but I had to eat those Gravenstein apples myself – too good even for the judges at the Pie Contest, sorry Evan, even if I did stand a chance at a ribbon. This would need to be a very special pie – not to win best in show but to do justice to the precious fruit generously given to me. I decided to make a French tart and use Chef Ludo Lefebvre’s crust recipe from Crave. What I like about his approach to the tart is that it lets the fruit speak for itself – the crust is a delicious vehicle in which the fruit can cook without being overly cloying or greasy. In my house when we need something cut finely we turn to Papa – his knife skills were honed in a French restaurant so you know he’s got chops! A few dots of butter and a sprinkling of confectioners sugar on top of the finely sliced fruit was all that was needed. I added a very fine dusting of cinnamon. I wish I could have a scratch and sniff blog post button just for the aromas that filled the house as the pie baked. Trivia: What is the difference between a tart and a pie? A: You can marry a tart! In all seriousness there is a difference that Martha Rose Schulman explained during a Venice Cooking School lesson as she made the best pecan pie – which was technically a tart – I’ve ever tasted. The difference is that the wall of the pan for a tart has straight sides, often with a removable bottom, whereas a pie pan or dish has sloping sides. Place the flour, powdered sugar and fleur de sel in the mixer with the butter and mix with the whisk attachment on medium speed until it resembles course breadcrumbs. Drizzle 2 tablespoons of the beaten egg over the mixture and form dough – if the mixture is too dry add more egg as needed. Make a ball with the dough, flatten and wrap in plastic wrap. Refrigerate for at least 30 minutes and up to one day. Roll out the dough between two pieces of plastic wrap until it’s about a round about 13 inches in diameter. Remove one piece of plastic wrap and hold in hand using the other piece of plastic wrap. Transfer to the 12-inch pan and ease into the sides. Fold the outside edge of the pastry in on itself to make a nice level edge about half way up the side of the pan. Refrigerate for 10 minutes. Line crust with aluminum foil and pie weights – I use lentils! Bake for 15 minutes. Remove the weights and foil and return to the oven. Bake until the crust just begins to turn golden brown on the edges, about another 10 minutes. Remove from the oven and cool on a rack in the pan. When cool gently remove the crust from the pan and place on a heavy baking sheet. Arrange the finely sliced Gravenstein apples in the crust in concentric circles starting with the outer circle. Sift powdered sugar and cinnamon over the top and dot with butter. Bake until the apples are tender and the crust is brown and crisp, about 30 minutes. We ate the tart when it was still warm from the oven with Carmela Salted Caramel ice cream and Rémy Martin Champagne cognac infused whipped cream. This would certainly be a total hit in my house!! 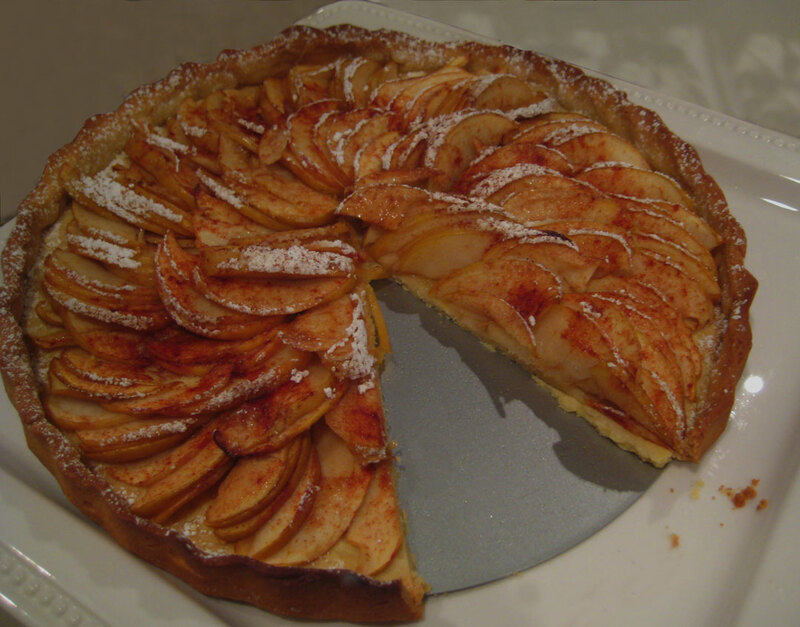 I love the fleur de Sel in the pastry crust – I bet that makes it extra delicious!